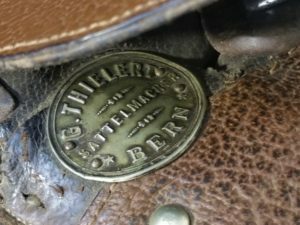 This Swiss Army cavalry saddle was made about 1910 by G. Thielert, Sattelmacrer in BERN, Switzerland. This collection was given to Nina & Francois Freyvogel by a Great Uncle. Colonel von Bonstetten used this during the 1st World War. He was an officer in the Swiss Army. Francois & Nina then brought it to Canada with them. Following the war many military saddles were used on local farms as this one was. 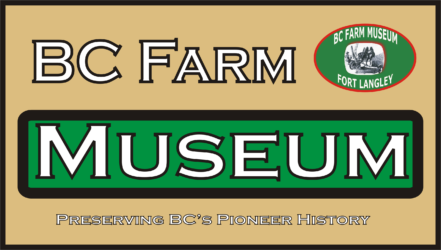 Francois used this saddle on his farm in the Chilliwack, BC area (Elkview Road) and also riding in the Interior of BC. Along with this saddle the Freyvogels also donated a set of beautiful leather saddle bags (or often called ‘wallets’) that would be mounted in front of the rider, 2 sets of leather boot spats, a canvas bag that would be tied over the back of the saddle for grain (Oats).The projection on the back is called a spoon and was used to attach the trooper’s bedroll. Two extra metal stirrups came with the donation. 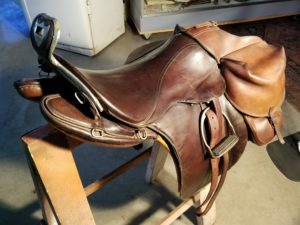 The Swiss saddle is of the colonial pattern like the British and Canadian cavalry. 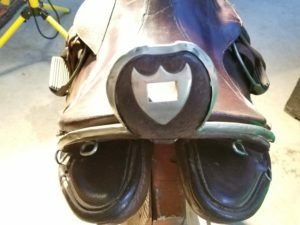 This saddle will go well with our two WW1 Canadian military saddles we now have on display. 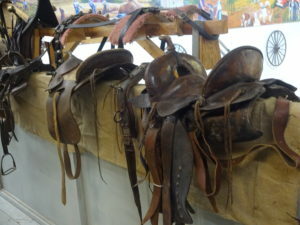 Following the war these saddles all found their way back to various farms and were used as school pony saddles etc.